Beatrcie Philip was the daughter of sculptor John Birnie Philip and his wife Frances Black. She studied art with her father and with the architect William Godwin, an an important personality in the Aesthetic Movement. After her father's death in 1875 she married Godwin and in 1876 they had a son, Edward. She continued working in Godwin's studio, making designs for furniture and houses. The painter Whistler was a close friend of Godwin and Beatrix. She posed for him in 1880 and her portrait was named "Harmony in Red: Lamplight". She also became one of his pupils, together with Walter Sickert. Most of her painting work is lost, allthough her studies "The Novel" and "The Muslin Gown" are in private collections. Oscar Wilde bought one of her panels. Ater Godwin died in 1886 she married Whistler in 1888. He mostly called her Trixie. They were happy together and they often created etches side by side. She also took care of his finances, improving them steadily. After only eight years she died of cancer, two days before turning fourty. Shortly before her death Whistler made another portrait of her, "By the Balcony". After her death her younger sister Rosalind took care of the ailing Whistler. 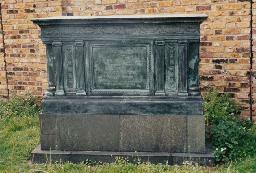 James MacNeill Whistler's grave at St. Nicholas' Churchyard, Chiswick Mall, Chiswick.